Having to fix the driveway because it was damaged by your dumpster, the project was delayed 1 day which caused us to have to pay for labor and use vacation because the BIN wasn’t delivered on time?Were you charged more due to these “hidden fee’s” and that caused you to go over budget? When you deal with companies that are so large, the neighborhood trust that you will be taken care of is often lost. 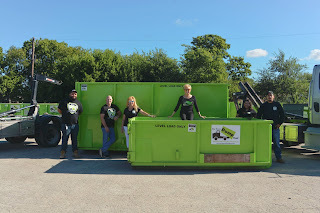 At Bin There Dump That, we pride ourselves in taking care of our customers and the community. Because without you, we wouldn’t be able to come into work every morning proud to help those who have been wronged by the big corporations. You can call in and often times will catch the CEO of BTDT working alongside her skilled team assisting customers who have attempted to use other providers which ultimately drove them to BTDT. If you are looking for a local company that will bring that Neighborhood trust back into business, please give us a call. We will gladly help in any way we can.